Euro Hotel London Clapham Make your day hotel stay enjoyable and comfortable by booking your day stay at Euro Hotel London Clapham. If you are looking for a comfortable hotel with modern amenities, Euro Hotel Clapham can be a perfect option. A Victorian style hotel with spacious rooms, this hotel welcomes guests with a memorable experience. 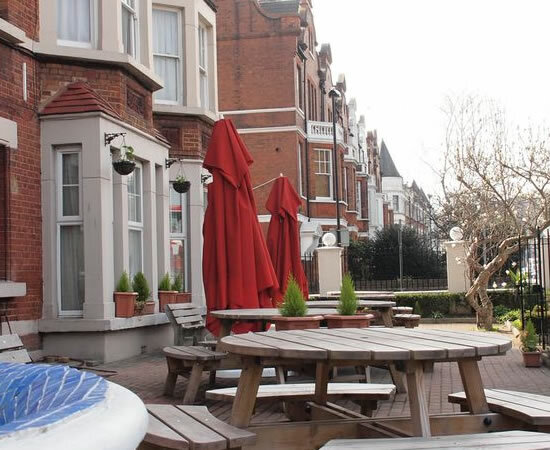 Ideal for both business and leisure trips, Euro Hotel Clapham can take care of your accommodation needs with ease. With a centrally accessible location and strong connectivity throughout the city, you can leave all your travel worries at bay. Book a flexible day stay or enjoy an extended holiday, everything is possible in this vibrant hotel. Each of their modern décor rooms is well equipped with convenient facilities. Flat screen TV, complimentary toiletries, coffee/tea making facilities, telephone, comfortable bedding and private bathroom provide the feel of home away from home. The hotel offers Wi-Fi access to help you stay connected. Enjoy a complimentary breakfast to kick-start your day. The hotel provides printing facilities. It also contains safety deposit box for all your valuables. A 24-hour reception and laundry services are available in the hotel. With easy access to Central London, the hotel can save your commute time. Explore all the major tourist attractions of the city to return back with loads of memories. The nearest station of Clapham south makes it well connected to the city. Besides, the neighborhood houses many restaurants, bars, cafes, and shops to make the most of your vacation. There many parks in the vicinity, making it an ideal destination for a family too. Stay at this comfortable hotel to enjoy the perks of a central location. Whether you head over for business or a much-needed vacation, experience it all at the Euro Hotel Clapham. Clapham Common — A large urban park in the neighborhood, Clapham common is a fun spot for all the members of the family. The park is equipped with - Children’s play areas, paddling pool, fishing pond, flower gardens, sports facilities, tennis court, skating facilities, football, softball and much more. There are three ponds and a historical landmark within its premises. O2 Brixton Academy — Head over to this vibrant music venue hosting rock concerts, band performances, club nights, comedy shows and much more. With international artists from around the world, it is famous for hosting a wide range of events all year round. Morleys in Brixton — For all your shopping needs, explore four floors of this retail center with wide range of shops. Within 2 miles from the hotel, Morleys will pull you into a huge world of fashion, clothing, lifestyle, home décor and everything you need in a family-friendly ambiance.